SKRILL IL METODO DI RICARICA PIU’ RAPIDO, SICURO E RICONOSCIUTO DA TUTTI I BOOKMAKERS! 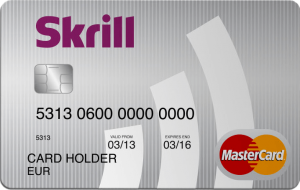 APRIRE UN CONTO SU SKRILL E’ GRATIS E GARANTISCE UN OTTIMA PROTEZIONE DEL VOSTRO DENARO DURANTE I TRASFERIMENTI SU CONTI GIOCO!! LO CONSIGLIO SEMPRE A CHI RICARICA ONLINE, SOPRATUTTO PERCHE’ OLTRE AI NUMEROSI VANTAGGI DESCRITTI TI DA’ LA POSSIBILITA’ DI RICHIEDERE SEMPRE GRATUITAMENTE UNA CARTA BANCOMAT, CIRCUITO MASTERCARD, PER POTER PRELEVARE LE VINCITE FACILMENTE SENZA DOVER ASPETTARE I LENTI PRELEVAMENTI DISPOSTI DAI BOOKMAKERS!! COME SE NON BASTASSE USARE SKRILL TI PERMETTE DI PARTECIPARE ALLE NUMEROSE ESTRAZIONI CON PREMI IN DENARO E BIGLIETTI DI EVENTI SPORTIVI PRESTIGIOSI COME LA CHAMPIONS LEAGUE!! LE TRANSAZIONI PER VERSARE SUI BOOKMAKERS SONO GRATIS, LE COMMISSIONI VENGONO APPLICATE SOLO PER EFFETTUARE PRELEVAMENTI DA SKRILL A CONTO PERSONALE. PER CHI COME ME TRAFERISCE INGENTI SOMME DI DENARO ESISTE ANCHE IL PROGRAMMA VIP, CHE VA A PREMIARE CHI MOVIMENTA GRANDI QUANTITA’ DI DENARO, ANDANDO A RICEVERE ULTERIORI BENEFICI!!! ESISTONO 4 GRADI VIP: BRONZE, SILVER, GOLD E DIAMOND!!! COME IMMAGINERETE RISPETTIVAMENTE GRADUATI DALLA QUANTITA’ DI DENARO TRASFERITO, ANCHE I SUDDETTI VANTAGGI VARIANO CON ESSI, COSA ASPETTI A SCOPRIRLI, REGISTRATI SUBITO!! !